The ACL is the critical knee ligament preventing the shin bone from sliding forward or rotating too far when the knee is under stress. ACL tears can occur after a direct blow to the knee or without contact when a player makes a sudden cut or pivot. The ACL also contains vital proprioception receptors that help a player “sense” where his knee is in space. Though a player’s ACL may be functional intact and stable a few months after reconstruction, it can take as long as 18 months for a player to sense that his knee is stable under stress. Though Grade 1 and 2 ACL strains can occur, direct blows and non-contact injuries to the ACL are most commonly complete tears requiring surgical reconstruction of the ligament. Surgery is usually delayed a few days to lessen the risk of scar tissue formation and sometimes longer to allow an accompanying MCL tear to heal and allow for more aggressive initial rehabilitation. Though it’s possible to compete at a high level without an intact ACL (i.e. Hines Ward), it’s rare to find a player with muscles strong enough around the knee joint to compensate and reconstruction is always recommended for an elite athlete after a complete tear. Arthroscopic surgical techniques and accelerated rehabilitation schedules have shortened the time to return from ACL reconstruction to as short as six months. Associated injuries like MCL sprains and meniscal tears or the development of scar tissue in the knee joint necessitating an additional surgical procedure can lengthen recovery times to 9-12 months. It’s again important to note that those timeframes correspond only to an intact and stable ACL that can be cleared for contact and that full recovery of proprioception may take longer. The MCL provides stability to the inside of the knee and is often injured when a player is hit on the outside of the knee, stretching the inside of the knee joint on the opposite side of the hit. Grade 1, 2 and 3 injuries are all commonly seen in football players. Many players, particularly offensive linemen, choose to wear braces to help prevent MCL injuries. MCL injuries, including complete tears, are allowed to heal without surgery. Rarely, very severe Grade 3 injuries or symptoms of chronic instability necessitate surgical reconstruction. Recovery and return to play depends on the severity of strain. Players with Grade 1 strains may be able to play with a brace and not miss time. Most players with a Grade 3 MCL tear will miss six weeks while the ligament fully heals. 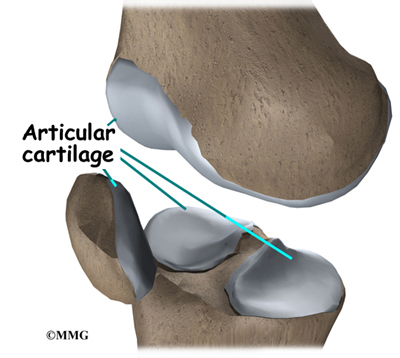 There are two kinds of cartilage in the knee joint. The surfaces of the femur, tibia and patella are covered with smooth, articular cartilage that allows the knee to slide easily during movement. 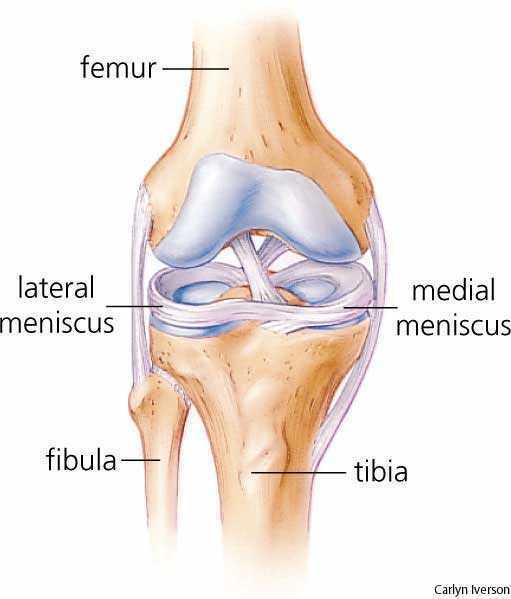 The knee also has two semi-circular shaped cartilage-like structures, the medial meniscus (inside of knee) and lateral meniscus (outside of knee), on the surface of the tibia. These meniscal cartilages act as shock-absorbers and help prevent injury to the articular cartilage of the knee. Both of these structures can be injured, usually when the knee is bent and then twisted. Both structures are also prone to degenerative changes, which can be accelerated by the high wear-and-tear football environment. Pain and swelling is common, with limited range of motion also a frequent symptom of these injuries. Because there are areas of both structures, particularly the articular cartilage surfaces, with relatively poor blood supply, no two injuries are alike and healing and recovery can be difficult to predict. Meniscal tears can be repaired (usually when the injury is to the thicker part of the meniscus at the outside of the joint) or the torn fragment can be removed or trimmed. To prevent damage to the articular cartilage and its associated high risk of arthritis, standard of care is to repair or preserve as much of the meniscus as possible. Players who have meniscal fragments removed can return to play much more quickly (1-2 weeks) than those who have their meniscus repaired (6 weeks and often longer). Articular cartilage wear and tear cannot be repaired surgically and the cartilage will not regenerate. Players with significant articular cartilage loss are often said to have a “bone-on-bone” condition. Often, microfracture surgery – a procedure in which multiple small holes are drilled into the bony surface to stimulate new (though not as durable as the original) cartilage growth – is the only option for symptom relief. The success of microfracture surgery is dependent on many factors and rest and rehab periods often extend past six weeks. The patellar tendon runs from the patella (kneecap) to the upper surface of the tibia (shin) and is necessary to extend the leg at the knee joint. Ruptures usually occur after a period of chronic inflammation and irritation and happen when the knee is bent, the foot planted and the thigh muscles contract to prevent a fall or change direction (i.e. landing after a jump or trying to prevent tripping to the ground). A torn patellar tendon in an elite athlete is always repaired surgically. Calcifications within the tendon, proximity of the tear to the kneecap and other associated injury can complicate repair. Rehabilitation and recovery lasts a minimum of six months and it may take 9-12 months before the large quadriceps muscles return to their former bulk and strength. Weakness, loss of explosiveness and reduced range of motion are common complications after a patellar tendon repair. Recent advances in surgical techniques and the continuing trend of aggressive rehabilitation schedules are promising (as they’ve been for Achilles tendon repairs) but it’s still too soon to assess how successful the changes in approach may be.